Inside Out is like nothing you’ve ever seen before from a Pixar movie, and that’s partly thanks to its animation. Following five core emotions that live inside a young girl’s mind, the film imagines its main characters comprised of energy, as opposed to physical beings. (Duh! They're emotions, not people.) This required some particularly expensive animating on Pixar’s part, which created the bubbling texture of their skin. If it wasn’t for Mr. John Lasseter's bold decision, Inside Out might not have ended up with this unique style. We worked on the idea of her [Joy] being effervescent or sparkly for champagne bubbles, for about 8 months. And it got to the point where we couldn’t afford to do it. There was just no way. … None of the other characters had it, because we just couldn’t afford it. When John saw it on Joy he said, 'That’s great. Put it on all the characters.' You could hear the core technical staff just hitting the ground, the budget falling through the roof. But it was all good. They found a way to make it work. It's difficult to see what he means by "effervescent" just by looking at the trailers. If you take a closer look below, you'll see how Anger's skin prickles, compared to the non-effervescent texture of his shirt and teeth. Worth noting, though, is that this is a more exaggerated instance of the technique. That tends to happen when Anger loses his cool. 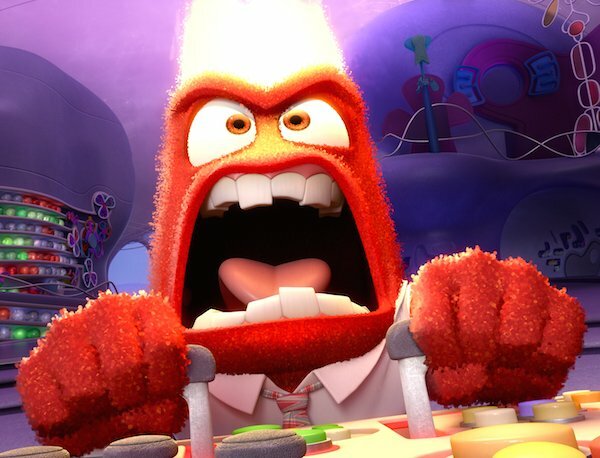 Inside Out stars Amy Poehler as Joy, Lewis Black as Anger (shown above), Mindy Kaling as Disgust, Phyllis Smith as Sadness and Bill Hader as Fear. Together, they influence Riley's mind and help steer her in the right direction. It was important for Pixar to make distinctions between the human world and its inhabitants, and the world of the mind. That was the biggest challenge, according to Egerton. The human world has Riley and her parents, and is generally duller in color and tone. The mind, on the other hand, is full of bright and bold colors, and fantastical settings. The sparkling forms of the emotions was just another small but effective finesse to help further differentiate them. If you want to learn more about Inside Out, get a sneak peek into its world and check back soon for more coverage of the film ahead of its June 19 release.